I'm new to Rainmeter. I know it can do lots of amazing stuff, but for the moment I only want to use it to replace my current Win 7 desktop. Why ? Because my obsolete weather widget doesn't work anymore ! - The 3rd widget is reduntant. I only use it to open the Task Manager (blue button), but I can just put a Task Manager shortcut instead. I have no idea on how to achieve this with Rainmeter, and it's all I want. So can somebody help me, please ? Jose Hidalgo wrote: - The 3rd widget is reduntant. I only use it to open the Task Manager (blue button), but I can just put a Task Manager shortcut instead. Also more skins posted previously can do this. As I said before, just search. 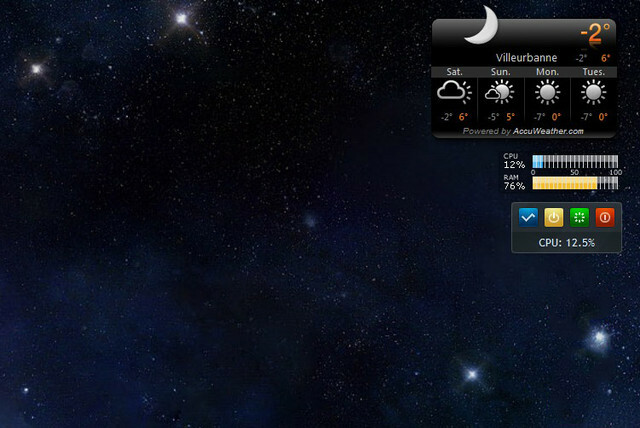 Its weather module is exactly what I'm looking for. For the CPU & RAM part, I haven't fount anything yet. This is because I'm looking for something REALLY simple and small, like in my previous picture. Just one horizontal bar for the CPU and one horizontal bar for the RAM, that's all ! Once I've found that, I'll start thinking on how to actually create my own skin with these 3 elements (background, weather, CPU/RAM). Depend just on you which package do you prefere. That's looking good indeed, but it's an old package and its code should have to be updated a bit. But it's working and this is I think the most important. Jose Hidalgo wrote: For the CPU & RAM part, I haven't fount anything yet. This is because I'm looking for something REALLY simple and small, like in my previous picture. Just one horizontal bar for the CPU and one horizontal bar for the RAM, that's all ! Obviously you can start playing around a bit, modifying the options, to personalize the skin, but this is the essence. Feel free to come back and ask if you have question related to this code. I hope you can get it to work. Please let me know if you did. Oh WOW, that's amazing ! Thank you SO MUCH ! 1. [CPURAM Skin] How could I make the RAM bar change color whenever RAM use is, say, >=80% ? 2. 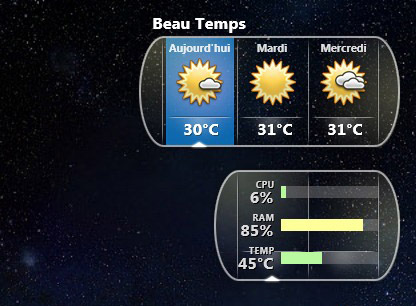 [Weather Skin] Do you think there's a way I could have all the weather info in another language, say, french ? I have looked in the .ini file, but the language info seems to come from the weather site. But I guess the weather site also has a french version, right ? 3. [Weather Skin] What parameter should I tweak in order to have today's weather info text (e.g. "Fair") BELOW the widget instead of being on top of it ? Many thanks again ! You're awesome ! Jose Hidalgo wrote: 1. [CPURAM Skin] How could I make the RAM bar change color whenever RAM use is, say, >=80% ? You can use some IfConditions. Here is almost midnight, but if no one will help you with this, tomorrow I will. Jose Hidalgo wrote: 2. [Weather Skin] Do you think there's a way I could have all the weather info in another language, say, french ? I have looked in the .ini file, but the language info seems to come from the weather site. But I guess the weather site also has a french version, right ? Add the same to the end of all other URLs. Jose Hidalgo wrote: 3. [Weather Skin] What parameter should I tweak in order to have today's weather info text (e.g. "Fair") BELOW the widget instead of being on top of it ? You have to change the Y option of the [MeterDesc] meter. Thanks ! Thanks to you I'm beginning to understand stuff ! 1. Weather skin language : I'm 67% successful. 2. I have also replaced "Today" with "Aujourd'hui", and it works. 3. However, I don't know how to make the two upcoming and dynamically named days (e.g. "Monday" and "Tuesday") display in another language. This is the only thing that's missing. 2. CPURAM skin : I have added a LeftMouseUpAction=["taskmgr.exe"] to invoke the Task Manager whenever I click on the CPURAM skin. It works great ! 3. CPURAM skin and IF conditions : I'll wait for your input, no worries. Good night ! 4. Core Temp skin : I'm 50% successful. I have created a Core Temp skin, with the Core Temp app starting with Windows, etc. The [MeterMaxTemp] is displayed well (e.g. 43°C). However, I can't get the [MeterMaxTempBar] to work (it's always stuck at 100%). I'm sure it's a stupid mistake. What do you think ? PS : as promised, I'll post a screenshot once everything is finished, and I'll upload some files if needed in the relevant forum section. Jose Hidalgo wrote: 1. Weather skin language : I'm 67% successful. Ok, related to translating Today, I think you got started to learn how does Rainmeter works, and this is very good. Congratulations and keep working, this is a very good start. To translate the names of the upcoming two days, you have to add the following option to the [MeasureWeatherDay2] and [MeasureWeatherDay3] measures: Substitute="Sunday":"Dimanche","Monday":"Lundi","Tuesday":"Mardi","Wednesday":"Mercredi","Thursday":"Jeudi","Friday":"Vendredi","Saturday":"Samedi" (please check the French translations, I used Google Translate to get them, so probably a quick check would be required). Jose Hidalgo wrote: 3. CPURAM skin and IF conditions : I'll wait for your input, no worries. Good night ! In paralel, because the color of the Bar meters are now set dynamically (through the apropriate options of the above measures), now you can remove the BarColor option of the [MeterCPUBar] and [MeterRAMBar] meters. Jose Hidalgo wrote: 4. Core Temp skin : I'm 50% successful. It's not stupid mistake, it's a small inexperience. It's happening because you didn't set the MinValue and the MaxValue options on the [MeasureMaxTempPercent] measure. These options are required on measures which are used by Bar meters (and any meter which requires percentual value, like Bar, Line or Roundline meter), because with these options, the meter calculates how large the bar should have to be. So, add a MinValue=0 and a MaxValue=100 option to the [MeasureMaxTempPercent] measure. Last edited by balala on September 10th, 2018, 1:32 pm, edited 1 time in total. You are such a great teacher Thanks to you I've got everything up and running now ! And it's beautiful ! Substitute=" And ":" et "
I guess the IF part in the Meters skin could be more efficient (BTW there was a small copy/paste mistake in your own code, you wrote MeterRAMBar instead of MeterCPUBar ). Probably with some else if I knew how to use them. Something like : if > 90 then RED, else if > 80 then YELLOW, else GREEN. I also replaced the #CRLF# part in your initial Meters skin code, because the vertical spacing between, say, "CPU" small text and "43°C" was too important. So instead I had to create some [MeterCPUSmallText], [MeterRAMSmallText] and [MeterMaxTempSmallText] sections, and X/Y align such texts individually. Again, it works, but I guess it could be more efficient. Many thanks again Sir ! PS : I have been to your DeviantArt page, and here's the first comment that I saw : "One of the most helpful person I've even meet in my life". I can ABSOLUTELY CONFIRM THAT ! You're amazing !! The IfConditions must be set in a way to have always only one condition true. That's why I used some InlineSettings, but as usual, a code can be done in more ways. I'm glad if you got it working as you wanted. About the efficiency, I'd add to the "static" strings (which don't change while the skin is running - I think all three mentioned meters are so) an UpdateDivider=-1 option, which make them to not being updated at all. But those strings being static, they don't even have to be updated. This step can save some (or even more) resources. Jose Hidalgo wrote: PS : I have been to your DeviantArt page, and here's the first comment that I saw : "One of the most helpful person I've even meet in my life". I can ABSOLUTELY CONFIRM THAT ! You're amazing !! Many thanks for the appreciations and your kind words.